It's here at last! Whoopie-do! Stampin' Up! Eu's long awaited new catalogue. It's bigger and better than before. The new colours are to die for, everything co-ordinated as only Stampin' Up! 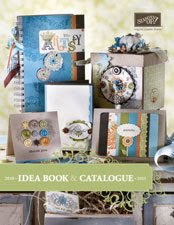 knows how, right across the board from cardstock to ink, to ribbons and embellishments as well as accessories. Lots of new punch shapes, curly label, designer label to name a few. Even MORE exiting is the introduction of clear mount blocks! The same red rubber image as used for the wood blocks but now the rubber sheet and its sticker images come in a compact, space saving DVD case which has picture references on the front cover and spine. How cool is that? ...and there's MORE! You loved the two-step bird punch, well now ALL the punches are in that style and we have a whole bunch of new punches which include the Scallop Trim Border and Corner Punch! Click on the picture of the catalogue in the side bar near the top of my blog to view our new catty online and email me if you wish to make a purchase. Better still, book a workshop, and get a copy of it for free - one of the perks of being a Hostess, and of course having the opportunity to earn some freebies! BEAUTIFUL CARDS FROM BEAUTIFUL PEOPLE!